do they wanna make it any more obvious that theyre milking every sucker for every last penny? "STOP MILKING THIS SERIES FFS! 3. £7.99 MAP PACKS ON WAW TO £10.99 MAP PACKS ON BO... STOP BEING SO GREEDY." yes, activision are too far up their own arses so they charge way more for DLC than anyone else and get away with selling incomplete games just to meet deadlines; Yet the poplularity only just seems to be waning after years of success based on the genre-defining CoD4. Bf3 will be where it's at. it is the publishers Activison who are to blame. i think that developers are decent, but activision are ruining the game and are portraying themselfs as increasingly greedy. didnt activision fire the leading developers of infinity ward after the controvicy of MW2 even though it got game of the year. agreed - its like theyre standing still on a rung of a ladder (admittedly a high one) whilst the other game just keep climbing up and soon will overtake them. I thought they were fired coz of the 'NO Russian' level, but fiering them for a complaint is even worse. i think infinity ward should make their own new frachise as cod is becoming a little repetative, although i think it provides the most balenced online gameplay. But its not yet perfect. if activision had done that then it wouldnt have been put into the final game. lol the amount microsoft have paid activision will ensure that they keep getting them a month earlier. yh they signed a deal so from MW2 onwards, 360 will get it 1 month before the other consoles. 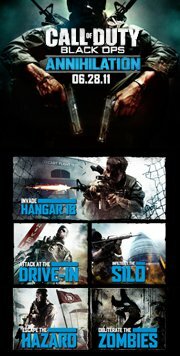 all these map packs but what i dont get is when they release another CoD why do they stop making them for the last CoD. I would love to still be getting Mw2 map packs, Blops is a con!